Prayer for Peace: The Saga of A Korean War Survivor by Aesop Rhim is a memoir in two overlapping parts, providing the reader with an intimate history of the Korean War as well as a poignant personal history of a Korean expatriate, with the two parts combining into a journey of survival, faith and art, fueled by an aspiration for peace. The early part of the book serves as a fascinating first-person eyewitness account of life in Korea from World War II onward, infused with knowledgeable insights, as well as historical, political and international facts, which endow this memoir with solid factual foundations. Eventually, an illness frees him from uniform, and he grows to embrace the Christian faith and study art in Seoul. Immigrating to the United States, the author earns an advanced degree in graphic design, marries and raises two daughters and, later on, visits North Korea and reconnects with his surviving family members. 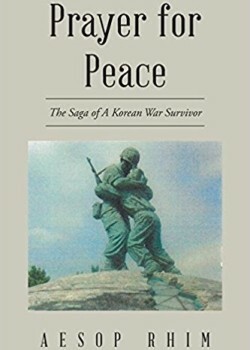 The tragic September 11 attack on the United States causes him to relive his Korean war experience – “There was similarity between the two tragedies—mass killing and senseless destruction arising from a base of blind hatred” – which in turn reignited his passion for promoting peace and the development of art exhibitions and international missions themed on his Prayer of Peace. The book includes many authentic photographs, which lend wonderful realism to the author’s story, as well as fitting scriptural quotations that tie in with the traumatic events.